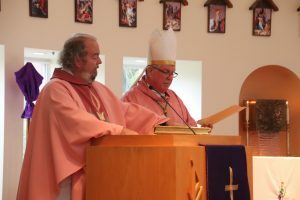 There are moments in the life of each Parish that are well remembered: the dedication of a new building, significant anniversaries, and of course, the installation of a new pastor. For the faithful of St. Vincent de Paul Parish in Fort Myers and San Antonio Parish in Port Charlotte, such a day occurred in March. It was on March 24 that Father Murchadh O’Madagain was installed at St. Vincent de Paul Parish, and on March 30 that Father Leo Riley was installed at San Antonio Parish. Bishop Frank J. Dewane presided over the installations which he said marks a key time in the life of the respective parishes. During the installation, the priest begins with selected words leading to the start of the Creed when he is then joined by the faithful. At the end of the Creed, the new pastor has extra lines which are exclusive for him. In addition, the pastor makes an Oath of Fidelity to the Bishop and his successors; formalized by his placing his hand upon the Book of Gospels. 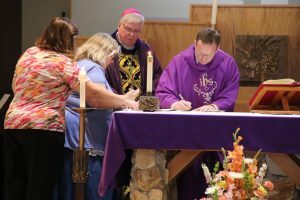 Following the installation, two members of the parish, representing the entire congregation, served as witnesses and signed the formal documents. Bishop then introduced the new pastors to rousing applause. Both new pastors thanked Bishop Dewane for their respective appointments and they commented on how hospitable their own parish community was from the day they were first assigned. After the installations, receptions were held in the parish halls. The installation of Father Riley coincided with his birthday, so it was a double celebration, cake and all.